When he was growing up — prior to World War II and the development of the island airport — people flocked to the 10,000-seat Hanlan’s Point Stadium, where baseball legend Babe Ruth hit his first professional home run. The lad’s house was near an amusement park with a Ferris wheel and a merry-go-round that he rode for free. “Hanlan’s Point was a Garden of Eden and a poor man’s paradise,” said Mr. Durnan in an interview last year. As an adult he lived on neighbouring Algonquin Island, never straying far from the land first inhabited by Durnans, Wards and Hanlans. 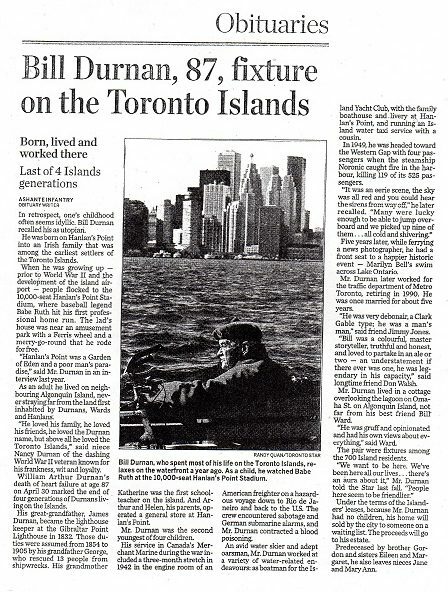 “He loved his family, he loved his friends, he loved the Durnan name, but above all he loved the Toronto Islands,” said niece Nancy Durnan of the dashing World War II veteran known for his frankness, wit and loyalty. William Arthur Durnan’s death of heart failure at age 87 on April 30 marked the end of four generations of Durnans living on the Islands. His great-grandfather, James Durnan, became the lighthouse keeper at the Gibraltar Point Lighthouse in 1832. Those duties were assumed from 1854 to 1905 by his grandfather George, who rescued 13 people from shipwrecks. His grandmother Katherine was the first schoolteacher on the island. And Arthur and Helen, his parents, operated a general store at Hanlan’s Point. Mr. Durnan was the second youngest of four children. His service in Canada’s Merchant Marine during the war included a three-month stretch in 1942 in the engine room of an American freighter on a hazardous voyage down to Rio de Janeiro and back to the U.S. The crew encountered sabotage and German submarine alarms, and Mr. Durnan contracted a blood poisoning. An avid water skier and adept oarsman, Mr. Durnan worked at a variety of water-related endeavours: as boatman for the Island Yacht Club, with the family boathouse and livery at Hanlan’s Point, and running an Island water taxi service with a cousin. In 1949, he was headed toward the Western Gap with four passengers when the steamship Noronic caught fire in the harbour, killing 119 of its 525 passengers. Five years later, while ferrying a news photographer, he had a front seat to a happier historic event — Marilyn Bell’s swim across Lake Ontario. Mr. Durnan later worked for the traffic department of Metro Toronto, retiring in 1990. He was once married for about five years. “He was very debonair, a Clark Gable type; he was a man’s man,” said friend Jimmy Jones. “Bill was a colourful, master storyteller, truthful and honest, and loved to partake in an ale or two — an understatement if there ever was one, he was legendary in his capacity,” said longtime friend Don Walsh. Mr. Durnan lived in a cottage overlooking the lagoon on Omaha St. on Algonquin Island, not far from his best friend Bill Ward. “He was gruff and opinionated and had his own views about everything,” said Ward. The pair were fixtures among the 700 Island residents. Under the terms of the Islanders’ leases, because Mr. Durnan had no children, his home will sold by the city to someone on a waiting list. The proceeds will go to his estate. Predeceased by brother Gordon and sisters Eileen and Margaret, he also leaves nieces Jane and Mary Ann.